Fountain Grass is a member of the Grass Fa mily. The plant is an attractive perennial bunch grass that grows in dense clumps with erect stems that grow 2 to 3 feet high. 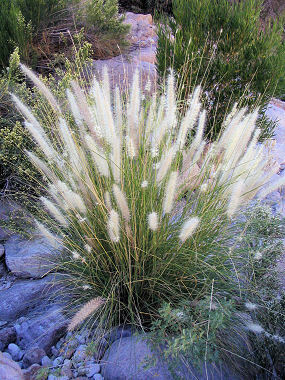 Although found in a wide elevation range, fountain grass is limited to areas with annual rainfall of less than 50 inches. In the southwestern United States, fountain grass invades grasslands, deserts, canyons and roadsides. In the U.S. the grass is found in Arizona, California, Colorado, Hawaii, Florida, Louisiana, and Tennessee. 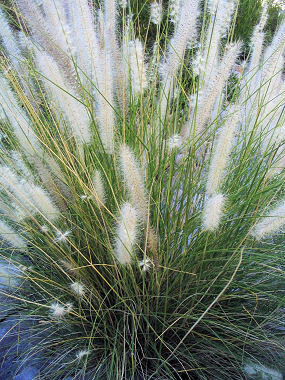 Fountain Grass is native to northern Africa. It has been introduced as an ornamental grass and is now considered an aggressive weed which posses a threat to native plants. Fountain Grass produces small, pink or purple flowers that are grouped in bristly, upright clusters ranging from 6 to 15 inches in length. The fruits are small, dry seeds adorned with long showy bristles. The seeds are primarily dispersed by wind and may remain viable in the soil for six years or longer. Seeds may also be dispersed greater distances by water, vehicles, livestock and humans.